My dad started pushing me into waves at the Hook, a local surf spot in Santa Cruz, CA, when I was six years old. I apply the values and techniques of circular living to everything that I do, and this includes surfing. I'm excited to share with you how I upcycle my surf wax! Upcycling surf wax provides us with an opportunity to get the most out of our surf wax, and reduces the amount of wax entering into the waste stream. Most surf waxes are made from petroleum, synthetic fragrances, dyes, and paint pigments, and are packaged in plastic. Not ocean safe! Opt for chemical -free wax that has a base of beeswax instead of petroleum, and is packaged in recyclable paperboard, or that's package-free (I have upcycled almost all of my old surf wax and have have been testing my recipe for cold water wax, which I will share with you soon)! No need to buy a fancy wax scraper as a large or small paint stir stick, free from the hardware store, works great! Wood won't scratch your board, it's compostable, and a great way to repurpose a paint stir stick. The curved handle is also nice for scraping any wax from your rails. My dad and I went to our local Freeline surf shop and bought a wooden wax scrapper designed by a local surf company, Ventana. We wanted to support our local surf community and artisans, and liked the saw tooth comb on the wax scraper for roughing up our waxed boards. It's best to avoid metal scrapers like putty knives, that can scratch or damage the finish on your surfboard. As I'm plastic-free, I don't recommend buying a plastic scraper; however, if you already have one, or want to upcycle a plastic putty knife, they do work well. The wax pot, like your rag and scrapers, are for upcycling wax only. If you don't have a pot that you want to permanently use for this circular process, I suggest hitting your local thrift store and scoring yourself a cheap stainless steel pot secondhand. 1. Pick a sunny spot. You'll need direct sunlight on your board in order to soften the wax. I like to lay a tarp down and set my surfbaord on it, to prevent any wax from falling on the ground while scraping. 2. Begin scraping the wax from the board. I like to start on the ends and scrape towards the middle, and eventually I create a wax ball in the middle of the board. 3. Pick up any fallen wax globs on the tarp, and clean your scraper, putting all the wax in your wax pot. 4. Wipe down your board and rails with your wax rag. 5. On the stove, make a double boiler by placing your wax pot into a larger pot of boiling water and let the wax completely melt. 6. Pour your wax into a silicon mold. Silicon molds can be purchased in most houseware departments. I use mine for soap making and for surf wax. 7. After your wax has completely cooled, pop it out and re-wax your board. Depending on the wax you upcycled, the final product may be a little sandy and discolored. It still works great, and looks aren't everything! 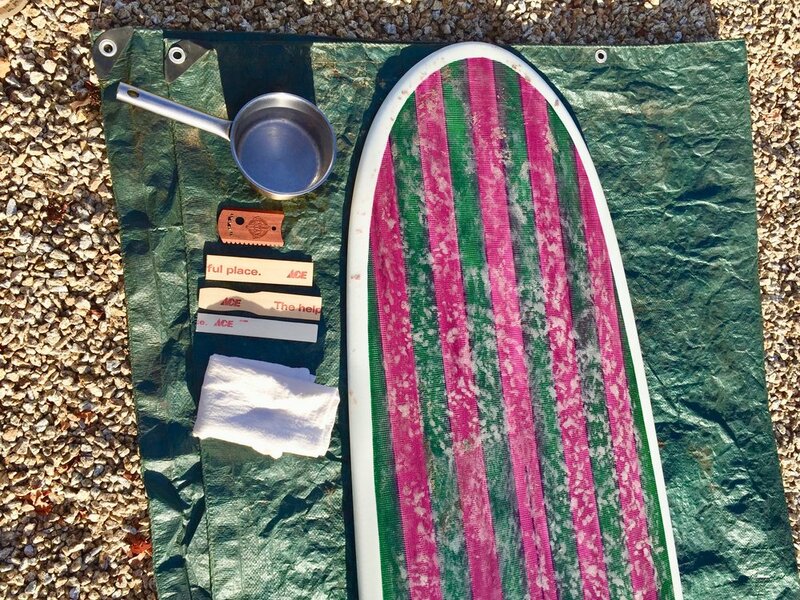 Hot Tip: Carry a surf wax tin/jar for any excess wax leftover after you wax your board, or if you're using the saw tooth side of a scraper when roughing up your board for traction. At many surf spots, the sidewalks and streets are polluted with globs of discarded wax. Having a wax tin is nice, because it not only helps to form the next wax ball, it's also kind to the planet.